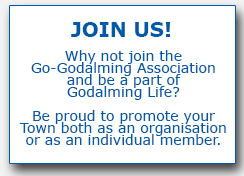 We are delighted to have so many affiliated organisations as part of the Association – the main groups are shown in detail and pictures can be found on the Gallery page of this site – other organisations are also members of Go Godalming and are listed below. commits us, in obedience to God's will and in the power of the Holy Spirit, to seek a deepening of our communion with Christ and with one another in the church, which is his body, and to fulfil our mission to proclaim the Gospel by common witness and service in the world, to the glory of one God; Father, Son and Holy Spirit. supporting one another's work in mutual trust and co-operation. Currently we perform a fully staged G&S opera every February, with a full orchestra under our musical director Robin Wells. In June or July we put on a smaller scale work, often at the Electric Theatre in Guildford. Our previous summer productions range from a concert version of ‘Aida’ to Joan Littlewood's Musical Entertainment, ‘Oh What a Lovely War’. In 2005 the Society performed ‘Iolanthe’ at the International Gilbert and Sullivan Festival in Buxton and in 2007 performed ‘Utopia Limited’ at the Waterford International Festival of Light Opera in Ireland, gaining an award. In 2012 we returned to Buxton to perform 'The Pirates of Penzance'. In 2014, we performed 'Princess Ida' at the International G&S festival in Harrogate, winning an award for 'Best Costumes'. We also have a very active social side to the group. We hold a wide range of social events and regularly organise trips to see other shows. The Godalming Trust is a voluntary organisation promoting high standards of planning, conservation and regeneration for the benefit of the local community in Godalming and Farncombe. It exists to bring together all who are interested in the town and its environs, aiming to stimulate interest in their history and character, and to promote a healthy sustainable balance between preservation of ancient buildings and new developments in building and landscaping.